Update #12: One Week Left! Art Contest, Jake’s stream song, Youtube Previews! Hey Shovelheads, only one week left!! AHHHHH! There’s so much left to do...a Reddit AMA, more knight reveals, more twitch streams, more art, more updates, more, more, more! Let’s make the most of it! I want to see 4 player battle mode come to fruition, and discover what those mystery stretch goals are!! A quick scheduling update - so we made a boo, boo, and we’ve decided to instead do the Reddit AMA one day later on Tuesday, 4/9, at 1PM EST/10AM PST. You have one more day to rally the troops and think of crazy questions. And if you want another LIVE playthrough on twitch, check out Man Vs. Game, who will be playing tomorrow ( Sunday, April 6 )! Shovel Knight Fan Art Contest!! Ok, so here’s the deal: we want to keep the creative juices of our fans going; so we’ve decided to have a contest! Draw your own original character, boss, scenario, etc who would be from Shovel Knight kingdom or take a stab at recreating a boss, character, scenario we have already revealed. What will you make? Plague Knight tossing bombs and Shovel Knight leaping out of the way? King Knight sitting among his loyal army of Flying Rats? A moody piece of Shovel Knight wandering down a winding road? 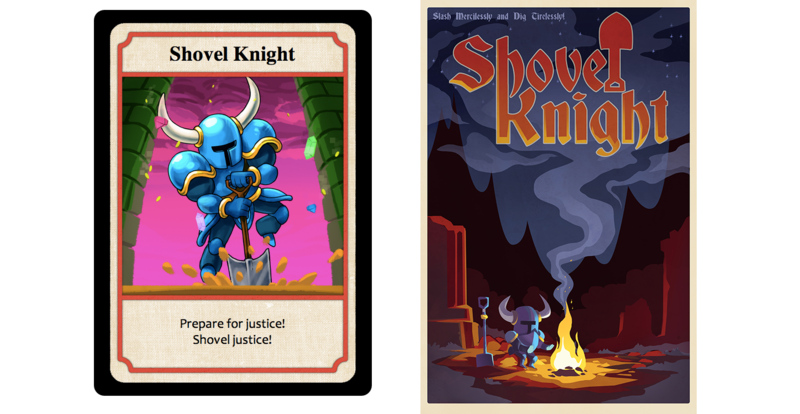 As long as it is Shovel Knight related, we want to see it. Art will be judged on how awesome it is; we’ll be accepting art of all media, talents, and ages. So don’t hold back, just express yourself!! We will look through all the submissions on Thursday, April 11th at 5pm PST and pick a winner. And hey, we aren’t just going to steal your precious art and run, there’s a prize! #1: We will grant you the $500 reward tier! That means you’ll get a deluxe luster finish hardcover art book, a super deluxe movie-style poster, your face in the game!, a super index card!, SUPERDELUXE DIRT! and a secret only you know, you’ll get to take part in design meetings and hangouts, a Shovel Knight Official Soundtrack Album, a printed instruction manual, a PDF coffee table book, a PDF instruction booklet, and a digital copy of Shovel Knight! Yeesh...you’ll need a yacht to carry all that free stuff! #2: If you create an original character, design, scenario, etc, we’ll find a way to feature it in the game! If you have any questions or concerns, as always, feel free to send us an email or a direct message. Good luck! 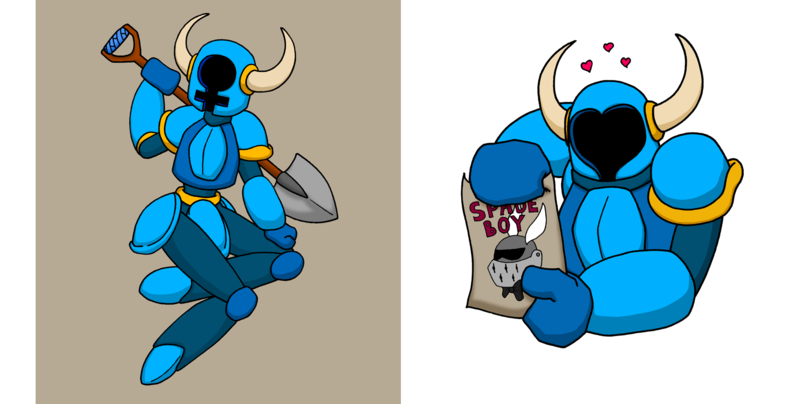 Shovel Knight Fan Art Recap!! Now we want to show off some new art! 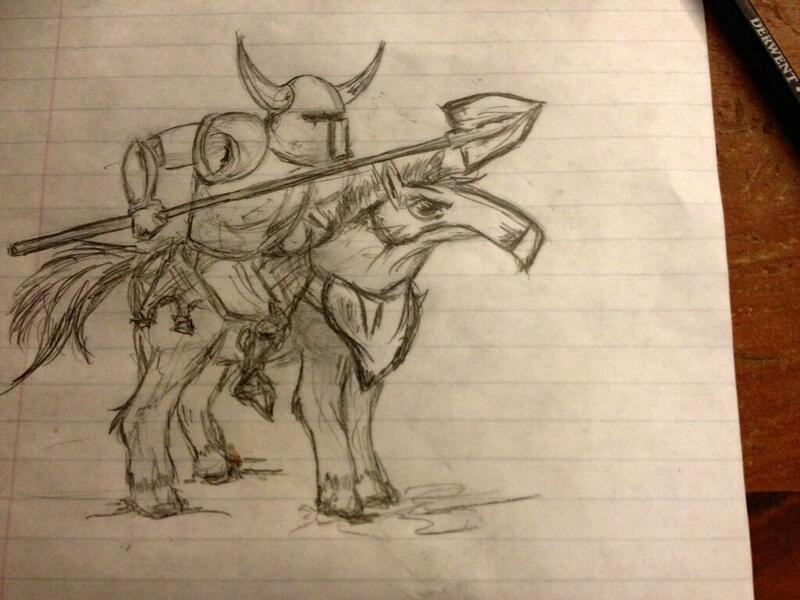 First, the most badass drawing of Shovel Knight yet, by Luzeke! 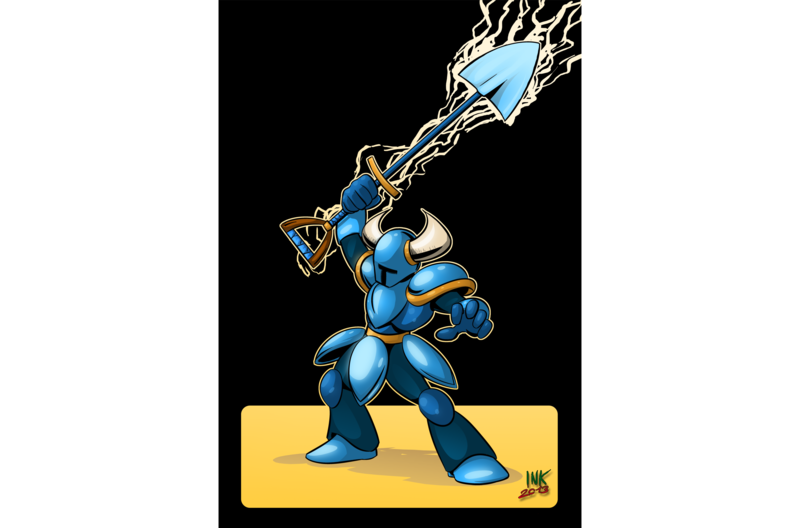 Propeller Knight is thwarted by Shovel Knight in this piece by Jeff Beckman! A lolworthy sneak peak at gender swap mode by Adam S! and this piece by Destructoid’s own Kyle MacGregor! Ride that Hoerse, Hero! The YouTube sensations Northern Lion and Epic Name Bro were kind enough to post previews our of our PAX demo. They both give great critiques of what we have put out so far, and their videos and commentary are much higher quality than what you’ve seen from us! Check them out, and keep giving them your support after as they run really cool channels. @Yacht Club Games: If you consider flying rats that will swarm you if you have your flashlight on " We Can See In The Dark... Can You?" as awesome, then yeah. They are referred as "rat-things" and "Stoopid-Rat-Things." Don't worry about that! :D I already showed your Kickstarter page and made them watch your preview video on it! For gender swap mode do you think that you could make the "two knight versions" slightly different gameplay wise a la Super Mario Bros. 2? Like maybe female Shovel Knight can hover for a tiny bit (use shovel as a propeller?) 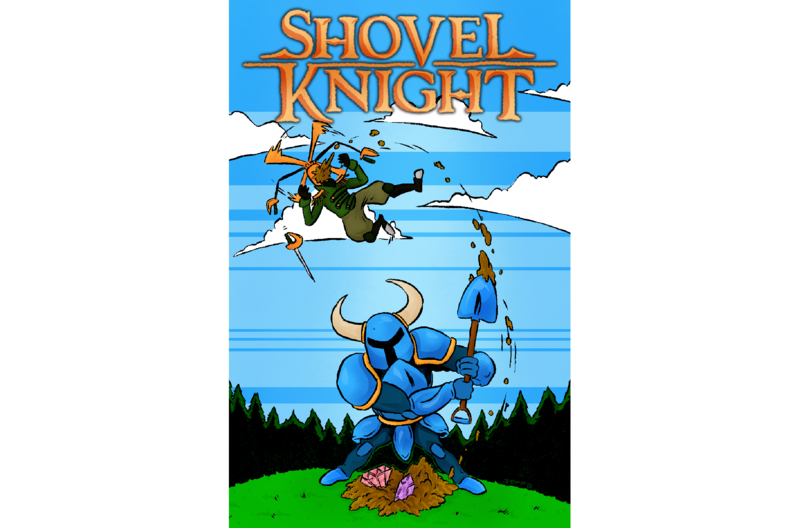 but has a lower shovel jump than male Shovel Knight? Could be a fun way to spice up the gameplay. @Yacht Club Games : That would be awesome, thanks! But seriously... I can't stop listening to Jake's work, I really love what he has done taht far, and that new song is just stuck in me head. He really worked some serious magic taht Friday! Adam S designs are just EPIC XD !!! More stretch goals are being reached this is a miracle! Congratulations once again! @Alejandro del Rio Verduzco: We'll figure out how to put the chat on stream so, in the future, you miss as little as possible! Still, watched the archived stream today, Propeller man's theme is soooo good! I specially love the beginning! I don't think I've heard many 8-bit tracks pull that kind of effect! @Dharma Mauricio and David Anderson Bell III: David is absolutely right....I think....or maybe it's Who-ers? @Wayne Griffin: That's a very interesting take on the gender swap that i hadn't really considered! @Nathan Black:Looking forward to it! @Alex Adams: Not that I'm aware of but does it have awesome flying rats in it? @Anthony Gallichand: If you won't watch it then you have to make all your friends, family, neighbors, classmates, dogs (both yours and theirs), cats (both yours and theirs) and iguanas (both yours and theirs) watch it! @Brian McBehrer: We will, but also thank you! The support means everything to us! ENB is actually the reason I found you guys. He's one of my favorites; his Dark Souls videos are fantastic. So, you can thank him for my $101. Did anyone on the team by any chance play a game called "Pathways into Darkness?" Niiice! Can't wait to see the artwork that people will put up. And it looks like we're close to the playable boss, too! Oh hell yeah I'm going to start work tonight on some art great idea thanks again guys and gals. We're so close to playable boss knight, I can almost taste it (it tastes like victory, btw). I was thinking about the playable boss knight and gender swap stretch goals and I wondered if we might get a gender swap playable boss mode in which we play as the enchantress in her quest to stop Shovel Knight from foiling her plans. It'd be like playing the game in reverse from the villain's point of view. I think it's like "Coerce". It's fun to say! How do I pronounce "hoerse"?